Hunter Debuts The Peep-Toe Rain Boot. Finally, Right?! Photo: Courtesy of Hunter Boot. We know from experience that wellies can be as necessary at any music festival as the entry ticket. But, c'mon, we need a little more versatility than just colors, patterns, and boot height. We want something that pays attention to all of the current fashion trends. 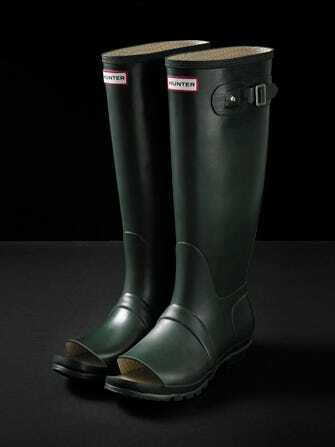 So, enter the “Open Toe Welly” from Hunter. Hot off the production line, it's described as “a fully breathable rubber boot option.” In other words: Hello, peep toe! It's a boot that gets us. The cutout at the front is functional — you know, for ventilation and such — while the shaft is still the perfect form of protection for the elements. Dry toes? So overrated. Of course, should you happen to remember the date, maybe you'll disagree. (Yes, it's April 1, y'all). While Hunter calls the boots “this summer’s must-have at festivals across the land," we have a feeling Glastonbury attendees will still prefer the originals — closed toes and all.